Bomba is an African-inspired folk music style of Puerto Rico that is deeply intertwined with dance. 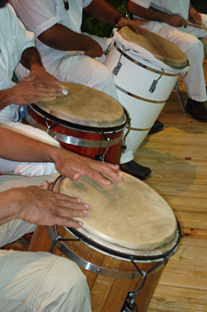 The Bomba percussion ensemble consists mainly of maracas, palitos (clave-like sticks struck together), a cua (a bamboo tube struck with wooden sticks), and hand drums known as “bariles,” because they were traditionally made from the wood of barrels. There are low-pitched hand drums like the “beleador” (the “segundo”), which lays the foundation of the beat, and the high-pitched “subidor” (the “primo”) which improvises. The dancers move their bodies in time with the drum beats, with the drummers challenging the dancers to dance with more and more intensity. If you want to learn how to play some “ritmos de la bomba” check out some music online, such as Paoli Mejias playing this subidor solo, bomba dancing in Loiza (shake it, dude in yellow tank top!) and old time bomba in black and white (shake it, dude in a white suit! ).